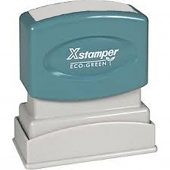 These self-inking stamps include many of the standard service lane messages needed to improve communications and customer satisfaction. We have 9 different messages that are in-stock and ready to ship the same day (such as WAIT, WASH, PICK UP TIME and others). We also offer custom stamps if our stock messages don't match your needs.